The spectrofluorometer QuantaMaster from PTI can be used for many basic spectroscopic applications like the determination of the excitation and emission characteristics of a sample. All Information given here is reliable to our best knowledge. However, no responsibility is assumed for possible inaccuracies or omissions. Specifications and external appearances are subject to change without notice. The upgrade kit can in principle be directly attached to the QuantaMaster. However, as there are some requirements that have to be fulfilled by the QuantaMaster, e.g. a second exit port at the monochromator or a second entrance port at the sample chamber, a close cooperation is needed to propose the optimum solution. Upon request an installation as well as an extensive training on the system is also possible. The excitation subsystem consists of a common pulsed diode laser driver and different laser heads or LEDs with pulses in the picosecond time regime. The available wavelengths range from 245 nm to 1550 nm. Wavelength changes are very easy as only the corresponding head needs to be changed. Two data acquisition modules (TimeHarp 260, PicoHarp 300) are available for the upgrade kit. They contain the complete timing electronics for Time-Correlated Single Photon Counting (TCSPC) with picosecond resolution. Depending on the type of excitation source and detector, fluorescence lifetimes down to 10 ps and phosphorescence lifetimes up to several milliseconds can be resolved. The data acquistion is controlled by an easy to use Windows software. A detector of the PMA Series is used for the upgrade kit. The detector has a built-in high voltage power supply, signal pre-amplifier and a gold plated iron housing for optimal timing performance and maximum RF and magnetic shielding. With this detector unit, an Instrument Response Function (IRF) of less than 200 ps can be achieved in combination with a diode laser. Various different cathode types are available that cover the spectral range between 185 nm and 820 nm. 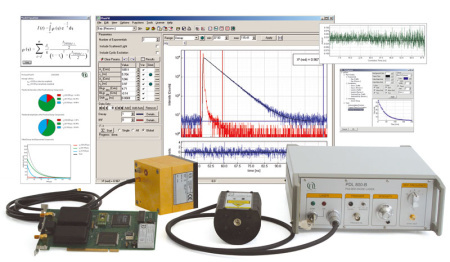 Acquired data can be directly transferred to the established FluoFit software for decay analysis. FluoFit features global decay analysis with an easy-to-use graphical user interface and presentation-ready numerical and graphical output. It implements an iterative reconvolution fitting routine with nonlinear error minimization. Various exponential decay models (up to fourth order including a scattered light term) or rate constant distribution models can be fitted to the observed decay in order to determine the fluorescence lifetime(s). IRF and decay background as well as time shift are included as fit parameters. 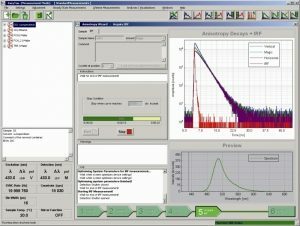 Anisotropy analysis and advanced error analysis with different methods is also possible. Global analysis is also supported for all included models.